This list is not guaranteed to be complete, or even completely accurate. I am not a flawless reporter. Removes the enhanced carry permit and its authority from state law, and removes prohibition on local governments posting illicit “no guns” signs. Basically means that your enhanced permit would revert to being a standard permit and you could be kept out of anywhere a sign is posted AND out of the list of places currently allowed only by an enhanced permit. Imposes a $25 fee on each retail gun sale, proceeds of which are distributed by the Attorney General to victims of mass shootings. Mass shootings are defined as “an incident in which three (3) or more persons are wounded by gunfire and which is not a domestic relations related incident.” No mention of whether the “victims” are innocent or are perhaps criminals being shot in self-defense. Requires DPS-issued purchase permit, legal background check, waiting period and mental health evaluation prior to legal purchase of automatic weapons. Requires seller to check the purchase permit and report the sale to local law enforcement. “Automatic weapons” are not defined. If Rep. Hines means machine guns, the bill is largely redundant and unnecessary. If he means anything else, it’s impossible. I suspect Rep. Hines doesn’t know what he means. Prohibits the use of “bump stocks” or similar devices when attached to semiautomatic weapons. Does not prohibit possession, or use if possible, on weapons that are not semiautomatic. Prohibits public employers of the state or its political subdivisions from adopting or establishing a policy prohibiting an employee with an enhanced carry license from lawfully carrying a concealed pistol or revolver on any property or in any building under the public employer’s control. We note that it’s already legal for such employees to carry without their employer’s permission and therefore could not be charged with a crime, but can be disciplined or fired. Presumably this bill would prevent that discipline by prohibiting the rule, though it doesn’t exactly state that. Provides that the legal right to possess weapons is restored upon completion of serving time in prison or jail for any person convicted of a felony that is not classified as a crime of violence under Mississippi Code Section 97-3-2. Prohibits altered, obliterated or removed manufacturers’ firearm serial numbers. Would seem to be redundant with federal law. Authorizes legal licensed concealed carry at public and private colleges, universities and institutions of higher education. This would be for regular permits — enhanced permits already allow for it. Lowers CCW license fees and streamlines application process for senior citizens age 65 and up. Prohibits Mississippi public servants and firearms dealers from enforcing or attempting to enforce any act, order, law, statute, rule or regulation of the United States government that has not been duly adopted by the United States Congress and signed by the President relating to a personal firearm, firearm accessory or ammunition that is owned or manufactured commercially or privately in Mississippi and that remains exclusively within the borders of Mississippi. Removes knives from the list of deadly weapons, the concealed carrying of which is generally illegal. Allows people convicted of a nonviolent felony to legally possess weapons, including firearms, in their own residence or vehicle. Removes the requirement to have a CCW license to carry a stun gun. Provides that each Mississippi justice, chancery and circuit court judge and each justice of the Supreme Court and Court of Appeals is authorized to exclusively regulate the possession, use or carrying, whether concealed or not, of all stun guns, pistols, revolvers, or other firearms and weapons in his or her own courtroom regardless of any municipal, county or other state agency regulation to the contrary. Prohibits weapon (includes knives, etc.) possession by anyone with a misdemeanor domestic violence conviction in any jurisdiction. Possession would be a 10-year felony. Requires that the DPS shall maintain an automated listing of persons who are the subject of mental illness notifications required to be submitted to the DPS for purposes of denying CCW licenses, and shall review the listing regularly and as necessary to comply with the provisions of the law. Requires hunter (firearm) safety course to be taught as part of required PE curriculum in 7th and 8th grades. No functional firearms to be present. Student can be excused by parent. Requires CCW license applicants to submit proof of a recent (last 12 months) mental health evaluation by a Mississippi licensed psychiatrist evidencing “no sign” of mental illness. Clarifies various CCW licensing procedures and record keeping. Adds machetes to the list of items felons are prohibited to possess. Possession would be a felony. (The rest of the list is: firearm or any bowie knife, dirk knife, butcher knife, switchblade knife, metallic knuckles, blackjack, or any muffler or silencer for any firearm.) Apparently chainsaws and bush hooks are still OK.
Bill is “By request,” so probably dead. Revises CCW renewals to eliminate re-submitting fingerprints (which they already have from the initial issuance) and substitutes a NICS recheck instead. Codifies the fact that an instructor-certified (enhanced) CCW licensee can legally carry on school property outside of one’s vehicle, whether openly or concealed. We note here that the MS Constitution forbids the legislature (and therefore local governments or public schools) from restricting open carry. Provides that DPS SHALL ISSUE a CCW license to applicants 18-20 years old IF the person has otherwise qualified for an instructor-certified concealed carry license. I read this to mean that the 18-20 year old license would be a non-enhanced license, or at least I predict that DPS will read it that way. Prohibits Mississippi LEOs from taking any action contrary to the Second Amendment of the US Constitution or the provisions of Article 3, Section 12, Mississippi Constitution. Would penalize an official, agent or employee of the State of Mississippi or a political subdivision thereof who orders an unlawful confiscation, but does not intend to penalize officers who follow orders. Good luck with that. Revises CCW license term from 5 years to 10 years, raises initial license fee from $80 to $140, raises renewal fee from $40 to $70, raises senior citizen renewal fee from $20 to $30, adds carry in a “pocket” to the methods not requiring a CCW license. Increases jail penalty to 1 year minimum and removes fine for second conviction of violation of carrying concealed weapon statute. Makes first conviction of unlawful possession of a handgun by a minor a misdemeanor, and a subsequent conviction a felony; both are currently a “delinquency.” Also makes possession of a bowie knife, dirk knife, butcher knife, dagger, slungshot, switchblade knife, blackjack, or metallic knuckles, by anyone on school property, a felony instead of a misdemeanor. Provides an enhanced penalty for assault and aggravated assault upon a student or teacher when present on educational property; or upon a person attending a service at a place of worship. Provides that murder which is perpetrated at a place of worship is capital murder. Requires DPS to create “any units necessary” to implement the duties assigned to the department and consistent with specific requirements of law, including, the Firearm Permit Division. Also requires that an “adequate number” of firearm permit fingerprint locations be “conveniently” located throughout the state, but in no event may the number of locations be fewer than the number of locations that existed on July 1, 2018. The DPS must publish on the application for a firearm permit the hours of operation for each location, and the hours of operation must also be posted on the main entrance of the location. The commissioner must ensure that every firearm permit fingerprint location has an employee available and on-site during all published hours of operation who is qualified to perform the type of fingerprinting technology in use at that location. Prohibits possession of a firearm while the person is participating in a parade or demonstration for which a permit is required. There is no mention of folks attending or present but not “participating” in the permitted parade or demonstration. We note that the MS Constitution forbids the legislature from restricting open carry. Also, there is no mention in this bill of conflicting provisions in the CCW permit law and open carry law. Prohibits possession of a weapon by persons convicted of a misdemeanor with an “enhanced” penalty due to the misdemeanor being perpetrated against a “protected” person (because of actual or perceived race, color, ancestry, ethnicity, religion, national origin or gender of the victim, or the victim’s actual or perceived employment as an LEO, firefighter or EMT). Moves the beginning of the 3-day “Second Amendment Tax Free” weekend from the last Friday in August to the Friday at least ten days before Labor Day. Prohibits sale by any person of a centerfire pistol or rifle cartridge without a serial number, with records kept for 5 years. Declares that that all federal acts, laws, orders, rules, regulations in violation of the 2nd Amendment to the US Constitution are invalid in this state, shall not be recognized by this state, are specifically rejected by this state, and shall be considered null and void and of no effect in this state. Further declares that it is the duty of the Legislature to adopt and enact any and all measures as may be necessary to prevent the enforcement of any federal acts, laws, orders, rules or regulations in violation of the 2nd Amendment to the US Constitution. 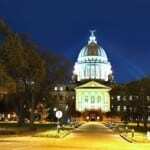 Mississippi Firearms Freedom Act. Declares that a personal firearm, a firearm accessory, or ammunition (small arms and not including destructive devices) that is manufactured commercially or privately in Mississippi and that remains within the borders of Mississippi is not subject to federal law or federal regulation, including registration, under the authority of Congress to regulate interstate commerce. It is declared by the Legislature that those items have not traveled in interstate commerce. This section applies to a firearm, a firearm accessory, or ammunition that is manufactured in Mississippi from basic materials and that can be manufactured without the inclusion of any significant parts imported from another state. This has been enacted in other states, and the federal courts haven’t been impressed. Mississippi School Safety Act. Requires assessments, training, drills.